The month of September was important for GIS industry with two important GIS events - FOSS4G in Denver and INTERGEO in Nuremberg. Along with the events product launches were also witnessed - Geomatica 2012, Trimble Trident Analyst, GIS Cloud default HTML5 support etc. All these products boast of robust productivity improvements in their respective realms, most important being native 64-bit support by Geomatica 2012 and Trimble Trident Analyst. 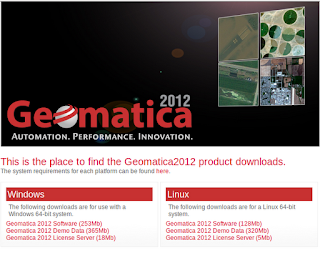 Both PCI Geomatics, the makers of Geomatica and Trimble claim improved performance with the support of 64-bit operating systems. Geomatica OrthoEngine comes with improvements in Manual Mosaicking, Physical Modeling, Adjust Orthos and Automated Processing. SAR Polarimetry Target Analysis (SPTA) application is integrated into Geomatica installation for the 2012 release and no longer runs as a separate application. Support for new sensors, formats and online data, notably ArcGIS Online which can serve as a backdrop in Geomatica Focus, and also as a potential GCP source or elevation dataset in OrthoEngine workflows. New functionalities - Coherent Change Detection, Optical Change Detection. ORTHO2, MOSRUN2, REPROJ2 functions have been designed specifically to take advantage of multiple processor machines and hyper-threading. Retired Functionality - OrthoEngine 3-D Feature Extraction, PSCREATE, PSINGEST, PSDTL. There are many other functionality improvements which have not been listed here. I was also surprised to see Geomatica 2012 being available for Linux while most of commercial GIS vendors are reluctant to provide Linux support. 64-bit processing allows Trident Analyst users to load, display, edit and analyze billions of points and thousands of high-resolution digital images quickly and effectively. The latest version incorporates new quality control tools for efficient review of positional and orientation accuracy, and quick validation of boresight parameters and registration results using passive objects in the mapping environment.